Inspiring a child’s curiosity and wonder in the world leads to a lifelong interest in learning. Pretend play helps your child organize and make sense of his world while learning social skills, hand-eye coordination, classification of objects, communication, counting skills, and more. Creating opportunities for your child to discover the "magic of our world" leads to future exploration and learning. 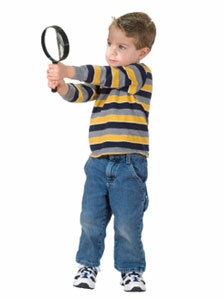 Early science, math and language arts concepts are all learned through the use of imagination and discovery.